The abundance of resources and relationships made easily accessible by the Internet will increasingly challenge us to revisit our roles as educators in sense-making, coaching, and credentialing. Because the world of work is increasingly collaborative, we have to rethink the way we structure student projects. The technologies we use are increasingly cloud based and our notion of IT support is decentralized. I expect most ETFO members can relate to these trends on some level. For example, Web-based report card software allows teachers to complete assessment and evaluation practices at school or at home, using multiple platforms. Critical friends In my role as a learning technologies coordinator, I regularly reflect on how best to assist classroom teachers. I collaborate regularly with David Carruthers, a grade 6 teacher at Mitchell Hepburn Public School in St. Thomas. He constantly works to develop teaching practices using technology to enable and support student learning, to differentiate instruction, and to support collaborative inquiry models. During the past four years, David and I have become “critical friends.” I enjoy stopping in to work with David’s class. “What do you have for us this time, Mr. E?” is how his students usually greet me. They expect me to demonstrate something new on each classroom visit. In most cases, David and I are surfing the same wave; however, once in a while I take a certain pride and pleasure in bringing him something new. We challenge each other with what if questions. Generally, I focus on some of the big ideas and theory, while David keeps the conversation grounded in the practicality of the classroom. Ours is a reflective, iterative process. David provides rich learning opportunities in his classroom, and I have witnessed a great deal of student success. When I interviewed a small group of his students, I asked them to reflect on the activities that stood out most in their minds. A student excitedly exclaimed, “I think the highlight of my year was the Khan Academy because you learn more math skills. And, it was more fun than just sitting in a classroom and listening to a teacher talking about any old thing.” Another explained: “The Kahn Academy is a Web-based program. You can sign in, and you can do all kinds of stuff. It’s not just math. They have other subjects too . . . and you can move on to become more proficient and stuff like that.” A final anecdote came from a keen young woman who stated passionately, “I was thinking about the Chris Hadfield interview through Skype. He is a famous Canadian astronaut. He was in Russia when we connected with him on the computer and big screen in our gym.” Observations My experience so far has led me to believe that there are three levels of technology integration present in a well balanced classroom. A large screen display connected to a powerful desktop or laptop computer is a great tool for activities such as whole-class shared reading and mathematics lessons. 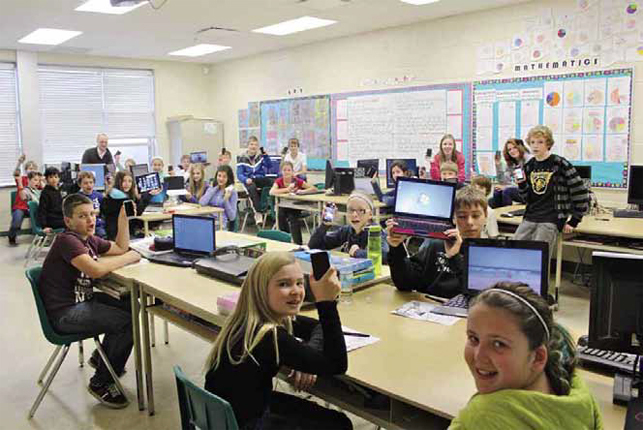 Wi-fi connectivity for students’ personal mobile devices is the final way to engage students by giving them access to personal learning tools at any time and in any place.